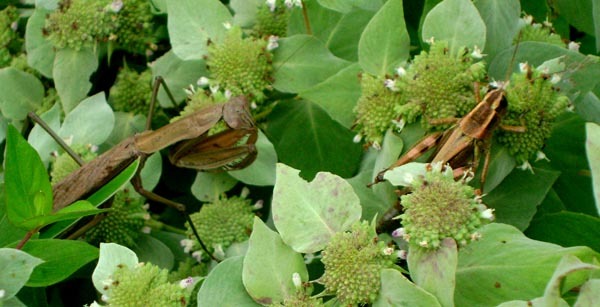 Whilst out perusing the bugs on my Mountain Mint I noticed a large Chinese Mantis tucked away in the deep foliage. The Chinese Mantis is an introduced species to the US that was brought here for its pest control properties. How much value it really was though is questionable as it also kills beneficial insects. Anyway here is a cool picture I snapped as it tracked down some lunch in the form of a grasshopper (anyone know the ID?) I looked up some info on BugGuide.net (a cool site recommended to me by naturalist at Quaker Ridge Ted Gilman) and American Bird Grasshopper seemed to match quite well, but I am not certain. nice pic, Luke… Did you get my message about a friend in San Francisco able to access the BBC site? Weird..